I packed up 43 cards to go to the Post Office this morning for Operation Write Home and lucky me — I have several KIDS cards included. Here are a few. This cardstock is Lemon Drop from My Favorite Things and the Hello die is from Elizabeth Crafts. The images on the next two cards are from Sassy Cheryl and colored with Copics. 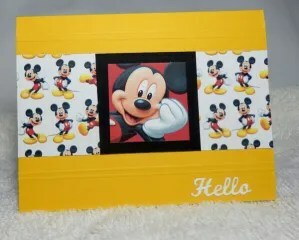 The little boy card I used My Favorite Things Blueprints 3 die cuts. The sentiment is also MFT. The image was printed from the computer and then I punched the corners. 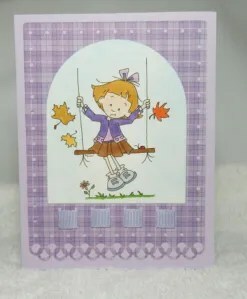 This one I used Spellbinders Card Creator A-2 Fancy Ribbon Threader die cut on the purple plaid paper (Recollections). I used My Favorite Things Blueprints 3 to die cut the image once it was printed. Such cute cards! Love that you did a girl and a boy card! Thanks so much – they were fun to color! So much fun! Great work! These are very sweet! Love the bright colors. Way to go on sending a box!